We're still welcoming applications for the first round of our 2019 Grant and Fellowship Programs! Exchange projects in the arts and culture, sports, intellectual exchange, and more are eligible. If you are thinking of a project in or with counterparts in Asia, please do use this opportunity to develop and materialize your ideas. Send your applications by DEC. 3, 2018! We look forward to receiving your applications. 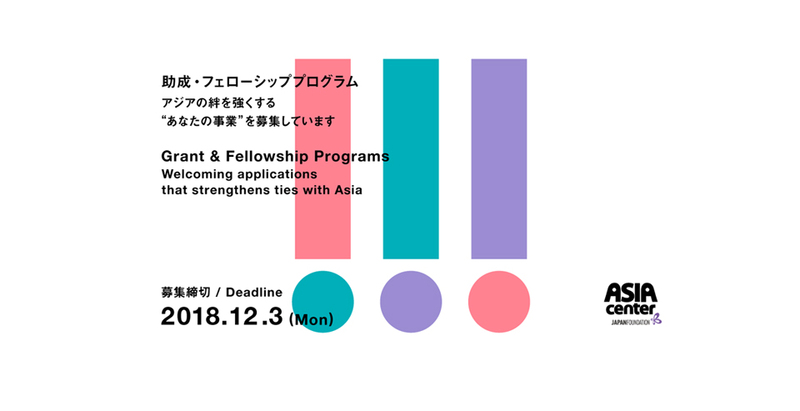 For more details, please visit THE JAPAN FOUNDATION ASIA CENTER Grant and Fellowship Program Website.